A Toronto transit worker’s addictions and extreme absenteeism was too much for his employer to accommodate, an Ontario arbitrator has ruled. John Tavares, 49, had a troubled history that led to drug and alcohol abuse and imprisonment. He sought treatment for his addictions several times and in 1998 he was hired by the Toronto Transit Commission (TTC) to work in its service department. He eventually became a janitor in the TTC’s subway operations plant maintenance department, where he cleaned, opened and closed subway stations and started escalators for customers. He was often the only TTC employee in a station other than the ticket collector, and usually worked close to the tracks and came into contact with customers. Occasionally, Tavares also had to deal with emergency situations if they came up where he was working. insubordination, absence without leave, lateness, failure to provide medical documentation in substantiation of absence, breaching conditions of a last chance agreement, engaging in erratic behaviour unbecoming a TTC employee and being unfit for duty. Starting in 2004, Tavares’ absenteeism rate skyrocketed and he missed 340 days of work between 2004 and 2009. When he admitted his addiction problems to the TTC, the commission gave him sick leave on multiple occasions so he could attend rehabilitation programs. The TTC also gave him a mandatory referral to an addictions counsellor through its employee assistance program (EAP) but Tavares continued to struggle. On Sept. 24, 2009, Tavares drank a large amount of alcohol at a wedding reception. He woke up early the next morning — when he was scheduled to work — and called in to say he would be a little late. On the call, he was incoherent and speaking with slurred words, so he was told to come directly to his foreperson’s office. The foreperson arranged to have two transit constables, a supervisor and a union steward at the office, which was standard procedure if an employee was suspected to be under the influence of a substance. When Tavares arrived, his eyes were glassy, his pupils were dilated, he was waving his arms around and making noises that sounded like a quacking duck. He was also dishevelled and fidgety, unsteadily pacing the floor while talking to himself in slurred speech in the main entrance area of the office. When his shop steward arrived, Tavares became upset and raised his voice. On Oct. 14, 2009, TTC relieved Tavares of duty for being absent without permission, late for work and showing up for work unfit for duty. It also determined it could no longer accommodate his addiction, given his disciplinary history and worsening of his conduct. Under the collective agreement, the TTC was also entitled to dismiss him for being impaired while on duty. The arbitrator found since it was a fact Tavares was impaired at work, the collective agreement prevented the dismissal from being overturned. 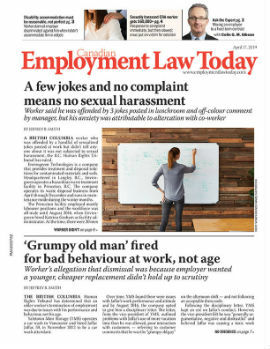 Though the arbitrator recognized Tavares’ efforts to seek treatment after his dismissal, he found the TTC had met its obligation under the Ontario Human Rights Code to accommodate Tavares’ disability and could no longer employ him without undue hardship. With no human rights violation, the collective agreement provision for dismissal for being intoxicated at work stood and the dismissal was upheld. “Despite (Tavares’) aforementioned admirable efforts to overcome his alcoholism and drug dependency, requiring the (TTC) to reinstate (him) under what would amount to yet another last chance agreement would impose undue hardship on the (TTC) and require it to go beyond the scope of its duty of accommodation under the code,” said the arbitrator. • A.T.U., Local 113 v. Toronto Transit Commission, 2012 CarswellOnt 9496 (Ont. Arb. Bd. ).